For other uses, see Minos (disambiguation). In Greek mythology, Minos (/ˈmaɪnɒs, -nəs/; Greek: Μίνως, Minōs) was the first King of Crete, son of Zeus and Europa. Every nine years, he made King Aegeus pick seven young boys and seven young girls to be sent to Daedalus's creation, the labyrinth, to be eaten by the Minotaur. After his death, Minos became a judge of the dead in the underworld. "Minos" is often interpreted as the Cretan word for "king", or, by a euhemerist interpretation, the name of a particular king that was subsequently used as a title. There is a name in Minoan Linear A mi-nu-te that may be related to Minos. According to La Marle's reading of Linear A, which has been heavily criticised as arbitrary, we should read mwi-nu ro-ja (Minos the king) on a Linear A tablet. The royal title ro-ja is read on several documents, including on stone libation tables from the sanctuaries, where it follows the name of the main god, Asirai (the equivalent of Sanskrit Asura, and of Avestan Ahura). La Marle suggests that the name mwi-nu (Minos) is expected to mean 'ascetic' as Sanskrit muni, and fits this explanation to the legend about Minos sometimes living in caves on Crete. If royal succession in Minoan Crete descended matrilinearly— from the queen to her firstborn daughter— the queen's husband would have become the Minos, or war chief. Some scholars see a connection between Minos and the names of other ancient founder-kings, such as Menes of Egypt, Mannus of Germany, and Manu of India, and even with Meon of Phrygia and Lydia (after him named Maeonia), Mizraim of Egypt in the Book of Genesis and the Canaanite deity Baal. Minos appears in Greek literature as the king of Knossos as early as Homer's Iliad and Odyssey. Thucydides tells us Minos was the most ancient man known to build a navy. He reigned over Crete and the islands of the Aegean Sea three generations before the Trojan War. He lived at Knossos for periods of nine years, where he received instruction from Zeus in the legislation which he gave to the island. He was the author of the Cretan constitution and the founder of its naval supremacy. On the Athenian stage Minos is a cruel tyrant, the heartless exactor of the tribute of Athenian youths to feed to the Minotaur; in revenge for the death of his son Androgeus during a riot (see Theseus). To reconcile the contradictory aspects of his character, as well as to explain how Minos governed Crete over a period spanning so many generations, two kings of the name of Minos were assumed by later poets and rationalizing mythologists, such as Diodorus Siculus and Plutarch— "putting aside the mythological element", as he claims— in his life of Theseus. According to this view, the first King Minos was the son of Zeus and Europa and brother of Rhadamanthys and Sarpedon. This was the 'good' king Minos, and he was held in such esteem by the Olympian gods that, after he died, he was made one of the three 'Judges of the Dead', alongside his brother Rhadamanthys and half-brother Aeacus. The wife of this 'Minos I' was said to be Itone (daughter of Lyctius) or Crete (a nymph or daughter of his stepfather Asterion), and he had a single son named Lycastus, his successor as King of Crete. Lycastus had a son named Minos, after his grandfather, born by Lycastus' wife, Ida, daughter of Corybas. This 'Minos II'— the 'bad' king Minos— is the son of this Lycastus, and was a far more colorful character than his father and grandfather. It would be to this Minos that we owe the myths of Theseus, Pasiphaë, the Minotaur, Daedalus, Glaucus, and Nisus. Unlike Minos I, Minos II fathered numerous children, including Androgeus, Catreus, Deucalion, Ariadne, Phaedra, and Glaucus — all born to him by his wife Pasiphaë. 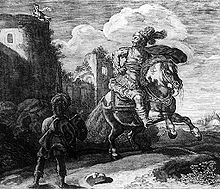 Through Deucalion, he was the grandfather of King Idomeneus, who led the Cretans to the Trojan War. Doubtless there is a considerable historical element in the legend, perhaps in the Phoenician origin of Europa; it is possible that not only Athens, but Mycenae itself, were once culturally bound to the kings of Knossos, as Minoan objects appear at Mycenaean sites. Minos himself is said to have died at Camicus in Sicily, whither he had gone in pursuit of Daedalus, who had given Ariadne the clue by which she guided Theseus through the labyrinth. He was killed by the daughter of Cocalus, king of Agrigentum, who poured boiling water over him while he was taking a bath. Subsequently his remains were sent back to the Cretans, who placed them in a sarcophagus, on which was inscribed: "The tomb of Minos, the son of Zeus." The earlier legend knows Minos as a beneficent ruler, legislator, and suppressor of piracy. His constitution was said to have formed the basis of that of Lycurgus for Sparta. In accordance with this, after his death he became judge of the shades in the underworld. In later versions, Aeacus and Rhadamanthus were made judges as well, with Minos leading as the "appeals court" judge. By his wife, Pasiphaë (or some say Crete), he fathered Ariadne, Androgeus, Deucalion, Phaedra, Glaucus, Catreus, Acacallis and Xenodice. By a nymph, Pareia, he had four sons, Eurymedon, Nephalion, Chryses and Philolaus, who were killed by Heracles in revenge for the murder of the latter's two companions. By Dexithea, one of the Telchines, he had a son called Euxanthius. By Androgeneia of Phaestus he had Asterion, who commanded the Cretan contingent in the war between Dionysus and the Indians. Also given as his children are Euryale, possibly the mother of Orion with Poseidon, and Pholegander, eponym of the island Pholegandros. Minos, along with his brothers, Rhadamanthys and Sarpedon, were raised by King Asterion (or Asterius) of Crete. When Asterion died, his throne was claimed by Minos who banished Sarpedon and, according to some sources, Rhadamanthys too. Asterion, king of Crete, adopted the three sons of Zeus and Europa, Minos, Sarpedon and Rhadamanthus. According to the Odyssey he spoke with Zeus every nine years for nine years. He got his laws straight from Zeus himself. When Minos' son Androgeos had won the Panathenaic Games the king, Aegeus, sent him to Marathon to fight a bull, resulting in the death of Androgeos. Outraged, Minos went to Athens to avenge his son, and on the way he camped at Megara where Nisos lived. Learning that Nisos' strength came from his hair, Minos gained the love of Scylla and her aid in cutting off her father's hair so that he could conquer the city. After his triumph, he punished Scylla for her treachery against her father by tying her to a boat and dragging her until she drowned. On arriving in Attica, he asked Zeus to punish the city, and the god struck it with plague and hunger. An oracle told the Athenians to meet any of Minos' demands if they wanted to escape the punishment. Minos then asked Athens to send seven boys and seven girls to Crete every nine years to be sacrificed to the Minotaur, the offspring from the zoophilic encounter of Minos' wife Pasiphaë with a certain bull that the king refused to sacrifice to Poseidon, which he had placed within a labyrinth he commanded his architect Daedalus to build. The Minotaur was defeated by the hero Theseus with the help of Minos' daughter Ariadne. One day, Glaucus was playing with a ball or mouse and suddenly disappeared. The Curetes told the Cretans "A marvelous creature has been born amongst you: whoever finds the true likeness for this creature will also find the child." Polyidus of Argos observed the similarity of a newborn calf in Minos' herd, colored white and red and black, to the ripening of the fruit of the bramble plant, and so Minos sent him to find Glaucus. Searching for the boy, Polyidus saw an owl driving bees away from a wine-cellar in Minos' palace. Inside the wine-cellar was a cask of honey, with Glaucus dead inside. Minos demanded Glaucus be brought back to life, though Polyidus objected. Minos shut Polyidus up in the wine-cellar with a sword. When a snake appeared nearby, Polyidus killed it with the sword. Another snake came for the first, and after seeing its mate dead, the second serpent left and brought back an herb which brought the first snake back to life. Following this example, Polyidus used the same herb to resurrect Glaucus. Minos refused to let Polyidus leave Crete until he taught Glaucus the art of divination. Polyidus did so, but then, at the last moment before leaving, he asked Glaucus to spit in his mouth. Glaucus did so, and forgot everything he had been taught. Minos justified his accession as king and prayed to Poseidon for a sign. Poseidon sent a giant white bull out of the sea. Minos was committed to sacrificing the bull to Poseidon, but then decided to substitute a different bull. In rage, Poseidon cursed Pasiphaë, Minos' wife, with a mad passion for the bull. Daedalus built her a wooden cow, which she hid inside. The bull mated with the wooden cow and Pasiphaë was impregnated by the bull, giving birth to a horrible monster, again named Asterius, the Minotaur, half man half bull. Daedalus then built a complicated "chamber that with its tangled windings perplexed the outward way" called the Labyrinth, and Minos put the Minotaur in it. To make sure no one would ever know the secret of who the Minotaur was and how to get out of the Labyrinth (Daedalus knew both of these things), Minos imprisoned Daedalus and his son, Icarus, along with the monster. Daedalus and Icarus flew away on wings Daedalus invented, but Icarus' wings melted because he flew too close to the sun. Icarus fell in the sea and drowned. 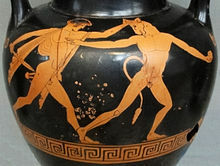 Amphora showing Theseus slaying the Minotaur, 460 BC. Ref:1837,0609.57 . Minos' son Androgeus won every game in a contest hosted by Aegeas of Athens. Alternatively, the other contestants were jealous of Androgeus and killed him. Minos was angry and declared war on Athens. He offered the Athenians peace if they sent Minos seven young men and seven virgin maidens to feed the Minotaur every year (which corresponded directly to the Minoans' meticulous records of lunar alignments - a full moon falls on the equinoxes once every eight years). This continued until Theseus killed the Minotaur with the help of Ariadne, Minos' lovestruck daughter. Minos was also part of the King Nisus story. Nisus was King of Megara, and he was invincible as long as a lock of crimson hair still existed, hidden in his white hair. Minos attacked Megara but Nisus knew he could not be beaten because he still had his lock of crimson hair. His daughter, Scylla, fell in love with Minos and proved it by cutting the crimson hair off her father's head. Nisus died and Megara fell to Crete. Minos spurned Scylla for disobeying her father. She was changed into a shearer bird, relentlessly pursued by her father, who was a falcon. Minos searched for Daedalus by traveling from city to city asking a riddle; he presented a spiral seashell and asked for it to be strung all the way through. When he reached Camicus, Sicily, King Cocalus, knowing Daedalus would be able to solve the riddle, fetched the old man. He tied the string to an ant, which walked through the seashell, stringing it all the way through. Minos then knew Daedalus was in the court of King Cocalus and demanded he be handed over. Cocalus managed to convince him to take a bath first; then Cocalus' daughters and Daedalus, with Minos trapped in the bath, scalded him to death with boiling water. After his death, Minos became a judge of the dead in Hades together with Aeacus and Rhadamanthus. Rhadamanthus judged the souls of Asians, Aeacus judged Europeans, and Minos had the deciding vote. On Cretan coins, Minos is represented as bearded, wearing a diadem, curly-haired, haughty and dignified, like the traditional portraits of his reputed father, Zeus. On painted vases and sarcophagus bas-reliefs he frequently occurs with Aeacus and Rhadamanthus as judges of the underworld and in connection with the Minotaur and Theseus. In Michelangelo's famous fresco, The Last Judgment (located in the Sistine Chapel), Minos appears as judge of the underworld, surrounded by a crowd of devils. With his tail coiled around him and two donkey ears (symbol of stupidity), Minos judges the damned as they are brought down to hell (see Inferno, Second Circle). 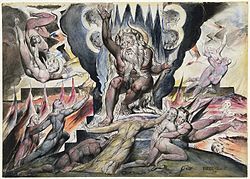 Minos depicted by Romantic British artist William Blake as part of his illustrations of Dante's Divine Comedy. The original object for this image is held by the National Gallery of Victoria. In the Aeneid of Virgil, Minos was the judge of those who had been given the death penalty on a false charge - Minos sits with a gigantic urn, and decides whether a soul should go to Elysium or Tartarus with the help of a silent jury. Radamanthus, his brother, is a judge at Tartarus who decides upon suitable punishments for sinners there. 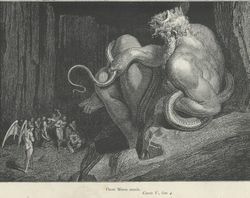 In Dante Alighieri's Divine Comedy story Inferno, Minos is depicted as having a snake-like tail. He sits at the entrance to the second circle in the Inferno, which is the beginning of Hell proper. There, he judges the sins of each soul and assigns it to its rightful punishment by indicating the circle to which it must descend. He does this by circling his tail around his own body the appropriate number of times. He can also speak, to clarify the soul's location within the circle indicated by the wrapping of his tail. Minos appeared as an antagonist against Percy Jackson in The Battle of the Labyrinth, the fourth book in the Percy Jackson series by Rick Riordan. Minos appeared to be helping the character Nico di Angelo raise his sister, who died in The Titan's Curse. It was later revealed that he was working with Luke Castellan to destroy Olympus. He revealed that he only helped Nico to trick him into killing Daedalus so he would come back instead of Bianca. King Minos and the Minotaur appear in In the Grip of the Minotaur by Farnham Bishop and Arthur Gilchrist Brodeur, a novel which was serialized in Adventure magazine in 1916. Set around 1400 B.C., it tells the story of a group of Northmen who visit the ancient Mediterranean on a trading mission and become embroiled in intrigues between the rising power of Troy and the mistress of the Mediterranean, Crete. Brodeur was a professor at Berkeley who translated Prose Edda by Snorri Sturluson and was a well-known Beowulf scholar. The novel was printed in book form for the first time in 2010 (ISBN 978-1-928619-98-7) by Black Dog Books. In Mark Z. Danielewski's House of Leaves, the story of Minos and the Minotaur is referenced several times, both accurately and inaccurately, when Zampanó discusses the thematic similarities between it and the house's labyrinth. Minos appears as a sympathetic character in Mary Renault's "The King Must Die". Slowly succumbing to the rages of leprosy, he hides his face by wearing a bull mask. Having no heir but an illegitimate stepson nicknamed "The Minotaur", he sees in captive Theseus a future king and husband to his daughter, Ariadne. ^ "We call him Minos, but we do not know his name, probably the word is a title, like Pharaoh or Caesar, and covers a multitude of kings" (Will Durant, The Life of Greece [The Story of Civilization Part II), New York: Simon & Schuster), 1939:11). ^ Younger, John. Critique of Decipherments by Hubert La Marle and Kjell Aartun. University of Kansas. 15 August 2009; last update: 5 July 2010 (Retrieved 25 August 2011): [La Marle] "assigns phonetic values to Linear signs based on superficial resemblances to signs in other scripts (the choice of scripts being already prejudiced to include only those from the eastern Mediterranean and northeast Africa), as if "C looks like O so it must be O." ^ Archivio veneto, Volume 16, 1878, p. 367. ^ Hesperien: zur Lösung des religiös-geschichtlichen Problems der alten Welt, Joseph Wormstall, 1878, p. 73. ^ On the origin and ramifications of the English language: Preceded by an inquiry into the primitive seats, early migrations, and final settlements of the principal European nations, Henry Welsford, 1845, pp. 11–12. ^ Homer, Iliad 13.450; Odyssey 11.321. ^ a b Thucydides, 1.4. ^ Powell, Barry B. Classical Myth. Second ed. With new translations of ancient texts by Herbert M. Howe. Upper Saddle River, New Jersey: Prentice-Hall, Inc., 1998, p. 346. ^ William Godwin (1876). "Lives of the Necromancers". p. 40. ^ Plutarch, Theseus §16 notes the discrepancy: "on the Attic stage Minos is always vilified... and yet Minos is said to have been a king and a lawgiver..." Lemprière A Classical Dictionary, s.v. "Minos" and "Minos II". ^ Pausanias 3. 2, 4. ^ Nonnus, Dionysiaca, 13. 220ff. ^ Bibliotheke 3.1.3; compare Diodorus Siculus 4.77.2 and John Tzetzes, Chiliades i.479ff. Lactantius Placidus, commentary on Statius, Thebaid v.431, according to whom the bull was sent, in answer to Minos's prayer, not by Poseidon but by Jupiter. ^ The act would have "returned" the bull to the god who sent it. ^ Apparently a quotation, according to Sir James George Frazer, (Apollodorus, The Library, with an English Translation, 1921), commenting on Bibliotheke 3.1.4. ^ Inferno V, 4–24; XXVII, 124–127). Wikisource has the text of the 1911 Encyclopædia Britannica article Minos.